I had been looking forward to revisiting Cavenham church for a long time. 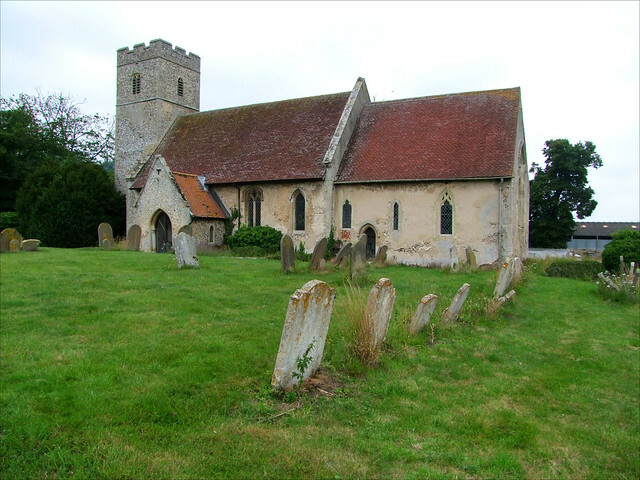 Back in 2003, it had been one of the five last of Suffolk's medieval parish churches which I had visited, all in a single day, to complete the set as it were. But this meant it wasn't really a priority for a revisit, of course. However, the years pass, and in Open Churches Week 2011 I found myself up in this part of Suffolk again. Here, where the Breckland begins, fields and copses sprawl between honest working villages, and it feels as if it might be the real heart of a Suffolk. A pity then, that this is one of the very few areas in all East Anglia where the churches are kept locked. St Andrew has at least the blessing of a keyholder notice, and this is good because his little church is far more interesting than at first it might appear. The most striking and unusual thing about the exterior is the drip course high on the western face of the tower. At one time, a structure was built against this side. What on earth could it have been? Western galilee porches are very unusual in Suffolk; there are only two, and one of them is on a round tower. The one on a square tower is at Debenham, and the church there is a large urban structure, quite different to this little country outpost. Besides, this drip course is very high, higher than the nave, and so it must have been at least a two-storey structure. The tower is not wide, so it is not impossible a structure here was wider than the body of the church. A possible clue is a few miles off at Lakenheath. There, in the years after the Reformation, a village school was built against the west face of the tower. It is two storeys high, and access is possible into the church through the former west door. Perhaps something similar happened here. The structure at Lakenheath was built with masonry rescued from the ruin of Eriswell St Peter, but perhaps the materials used here were less good, and the structure was later demolished. At some point in the 19th century the bottom of the west door seems to have been blocked up, and there is now a window here. Another possibility, of course, is that this was once a much larger cruciform church with a central tower, although this seems very unlikely given the age of the present nave and chancel. It is a very high drip course, though. You might notice the two reliefs carved under the western gable of the nave. They look as if they might be rabbits, or more accurately coneys, since the word rabbit meant the meat of the beast until at least the 19th century. Perhaps they are from a bestiary, or are heraldic; but we are on the edge of one of the main production centres of coney fur from the middle ages onwards. You enter through the south porch. This is a small church, and not terribly light inside, but one thing that might strike you is that there is a considerable amount of surviving wall paint. The familiar 14th century red ochre is on door arches in the nave, and there is more up in the chancel, particularly on a tomb recess. We know that all our churches were richly decorated inside, but somewhere like this you can see what that might have meant; not just devotional pictures, but simple decoration as well. There is just one small surviving fragment of wall painting, but it is of outstanding interest. It is in the north-east corner of the nave, and shows what appears to be a king with a scythe, and some children in front of him. The subject appears to be Suffolks only surviving representation of St Walstan. Walstan was an East Anglian Saint who came to be associated with ploughmen, and as such his cult was political as well as devotional. The heart of the Walstan cult was just to the west of Norwich at Bawburgh and Tasburgh, but it was almost entirely effaced and forgotten in the years after the Reformation. It is only painstaking research in recent years that has restored to us this forgotten focus of rural English Catholicism. Perhaps further research will confirm for certain that this is him here at Cavenham. Another intriguing medieval survival is the glass in the south-west window of the chancel. At first sight it appears plain; but look closely in the yellow border, which Mortlock tells us is 13th century. At the very top there is an inscription in Norman French asking for prayers for Adam the Vicar. In contrast, the window in the south east corner of the nave is a lush 1920s war memorial depicting St George. HeThe drawing of his face is not good, giving it a peculiarly cartoon-like feel. The more you look around this church, the more surviving medieval evidence there is. The screen is a good one, although it has been scoured of its catholic imagery. The traces of repainting may be early 17th century, for it was at this time the curious embellishments above the entrance were made. Another medieval survivor is the grand columned piscina up in the sanctuary; recut certainly, but not the surviving head of one of the sedilia arches. There is a post-Reformation brass inscription in the middle of the nave floor to John Symunt, a model of protestant simplicity. At the west end of the church the font looks like a melted cheese; it is hard to tell if it is in its original configuration, or, indeed, if it was actually a font at all. A big clue that it was is that it has been heavily plastered over, as many fonts were in the later 16th century. There is a 17th century coffin plate on a window sill at the back of the church, but it is in very bad condition and was probably dug up in the graveyard. More recently, the WWI memorial is a 1920s stained glass window by Jones & Willis depicting St George, but it really isn't very good, I'm afraid. Perhaps the strangest survival here is the extensive graffiti on the eastern faces of the chancel arch. Some of it is dated to the 1640s and 1650s, which is during the Commonwealth. At this time, the Church of England was supressed, and replaced with a presbyterian system of church government. Some churches hosted congregational worship, but others were put to different uses. Perhaps this graffiti survives from a time when the chancel was in use as a school, or even a stable. Coming back in 2011, I found the church much as I remembered it, but couldn't help thinking it had a rather forlorn and unkempt feel to it. It's a shame. This is super church, little-known but full of interest. It should have more visitors, and there is really no reason to keep it locked. It should be open.